By the end of the issue, when Johnny is using peyote to try and break down what appears to be a monumental and orchestrated facade, it feels as if the series has not only come full circle but also a climax is in sight. Johnny / Danny, with a wig in one hand and a gun in his other, makes a decision which is going to effect his, and Loreli's lives forever. It may even have massive repercussions for the whole world. This is such a brilliant issue, and the best title of the week already, because the issue spills over with smart dialogue and great art, each frame packed with tension, love, energy and LIFE. A lust for life spills out of all these pages. The book celebrates the art of staying alive and surviving, even when death is all around and closing in. More, please. Verdict. Title of the week. Read it. If you have not read the other 12, go and find them and then read this. It is the cherry on the top so far. Who knows the truth anymore and what is real in Danny / Johnny's life? Who cares? Will we ever find out what the real truth is? 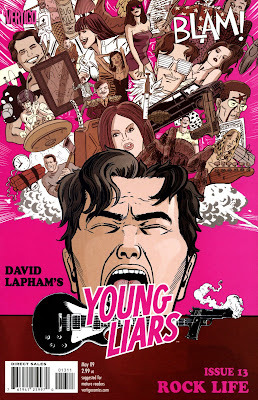 Note to David Lapham - Just keep delivering the goods and you can continue spinning tales (it is a real web of deceit - metaphorically and in reality...or are the Spiders from Mars a mere fantasy??) until you decide enough is enough and you decide to tell us what the hell 'Young Liars' is about. Until then, thank you for this wonderful installment. 9 out of 10.